When I first saw inFAMOUS: Second Son a little more than a year ago, it definitely looked promising, but back then I still wasn’t sold. It had great visuals, but a lot of what we were shown in that cold day of February 2013 looked great, so inFAMOUS didn’t stand out too much. It wasn’t until Gamescom in August that the true magnitude of the game started to dawn on me, not only because of its visuals, but also because how much more fluid and fun it seemed compared to the previous chapters of the franchise. 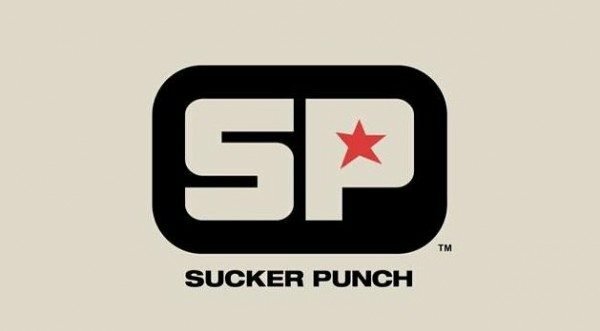 After going dark for quite a while Sucker Punch seemed to have finally hit the spot. At that time, though, I still didn’t get to go hands-on with the game, as the presentation was strictly hands-off, but at long last I managed to, and again the game found ways to surprise me. 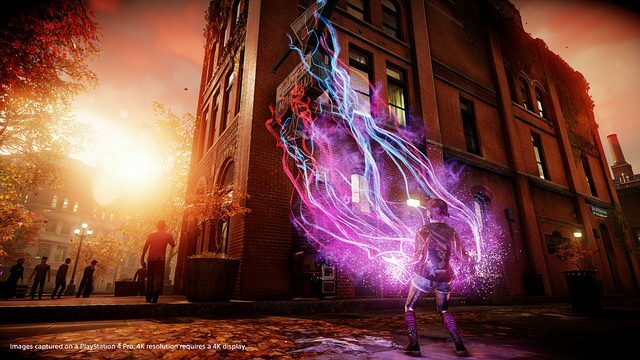 I’m quite sure you know by now that inFAMOUS: Second Son looks phenomenal: hundreds of particles flying all over the screen, reflections that manage by themselves to stir an emotional response even just by looking at the asphalt made wet by the rain, lighting that hasn’t been seen on a console game before… this title seems to have it all. There’s one thing in the game’s visuals that really draws my attention, even if it’s just an indirect consequence of its technical galore. 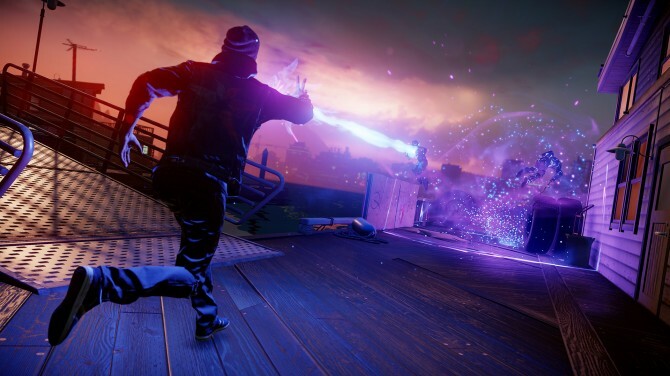 It’s more a result of its art direction and of the “enjoy your powers” philosophy that permeates inFAMOUS: Second Son: if there’s a feeling that could be used to describe Sucker Punch’s latest labor of love it would be pure, unadulterated joy. I’m not saying that the plot isn’t dramatic. From what I could see it definitely has the potential to bring some gloomy moments, but when you run around Seattle throwing fireworks at your enemies and dropping cocky oneliners, it’s simply impossible not to feel joyous and exhilarated. 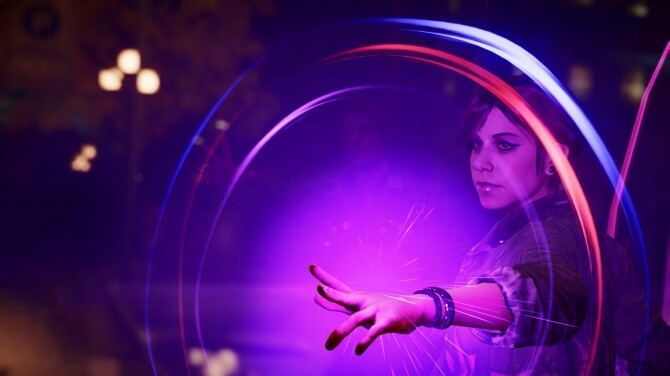 Everything is colorful, from the rich architecture of the city, with its buildings made of red bricks and its countless neon signs, to Delsin’s flashy powers. Even the DUP goons walk around dressed in yellow. And yet all those colors assaulting your eyes aren’t tacky. 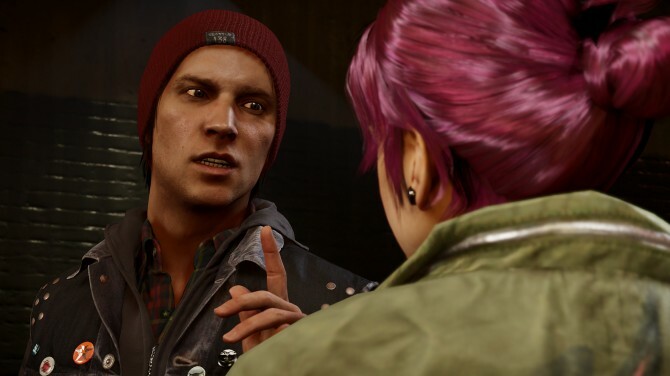 They don’t make inFAMOUS: Second Son’s quite realistic graphics look cartoony. They just give you a lovely sensation of joy that accompanies every fight and every romp across the streets of the virtual rendition of Seattle. 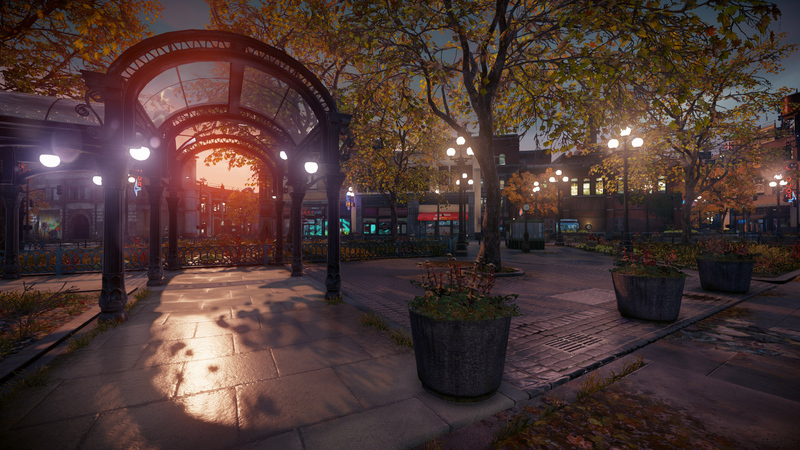 And oh boy Seattle… Sucker Punch did a masterful job in creating just the perfect open world superhero playground. It’s beautiful and visually impressive, large but not distracting, and it really, really makes you want to explore it all. If I have to find a flaw, it’s that there seem to be a few repeated buildings around the city. I can’t put a finger on it, but I can almost swear that the demo build I tried seemed to have the same Irish pub in at least two different locations. I’m sure our following review will shed some light on that, but that’s the sensation I had. That said, the only “virtual” city that gave me a similar pleasure in exploring has to be Yakuza‘s Kamurocho, but inFAMOUS: Second Son replaces the deep interaction with shops and minigames with the ability to explore vertically and horizontally with an enormous degree of freedom. And that’s where your movement powers, and especially the dash, come into the picture. You can run around at ground level or dash up the walls and between roofs. Gone is the slightly awkward parkour movement from inFAMOUS and inFAMOUS 2, replaced by a system that is a lot more intuitive. No matter where you want to go, you can get there and fast. The dash also makes combat a lot more fun and frenetic. You go in and get out at leisure. You’re the one that dictates the pace of battles, and your enemies (unless they’re bosses) are clay in your hands. It’s an empowering sensation. This doesn’t mean that the game is easy. It often throws at you enough enemies to be challenging, especially at higher difficulties, but if you have mastered your powers and the control scheme (and it’s very fun and easy to do), you can feel like you’re leading the dance, which is often not the case in this kind of games, where ducking for cover is the thing you’ll do most often. That said, I’ll have to wait for the final build to judge challenge precisely, as death was deactivated in the demo. You know, game journalists need that kind of crutch at times. Your fighting style is also determined radically by whether you’re playing good or evil. If you want to unlock the most powerful and extremely satisfying “Karma Bomb” you have to line up karma streaks. That’s normally done by killing enemies if you’re a villain and by incapacitating them if you’re the friendly neighborhood superhero. The main difference is by how you maintain the streak: if you’re evil you have to be fast, as a rather short timer will make you lose your streak if you go too long without killing anyone. If you’re good you need to be precise and avoid headshots and executions. A mistake and your streak is gone, which is very appropriate to the way heroes and villains are supposed to fight and affords a further degree of depth to the game. And there’s more: the missions themselves and the story vary radically depending on your moral alignment, pushing the level of replayability even higher. The inclusion of different powers is just the cherry on the proverbial cake. Smoke and neon (the only two I could try) play similar enough to let you fight without having to learn a new control scheme for each, but they’re definitely different in their style, giving you an enormous amount of freedom of choice in obliterating your enemies. During the demo I found myself switching powers just for the hell of it, simply because I felt the need to change style over and over. The reason was simple: it was fun. I couldn’t decide on a favorite, so I simply didn’t stick with one, and I can’t even imagine just how great it’ll be when the full game will give me even more to choose from. 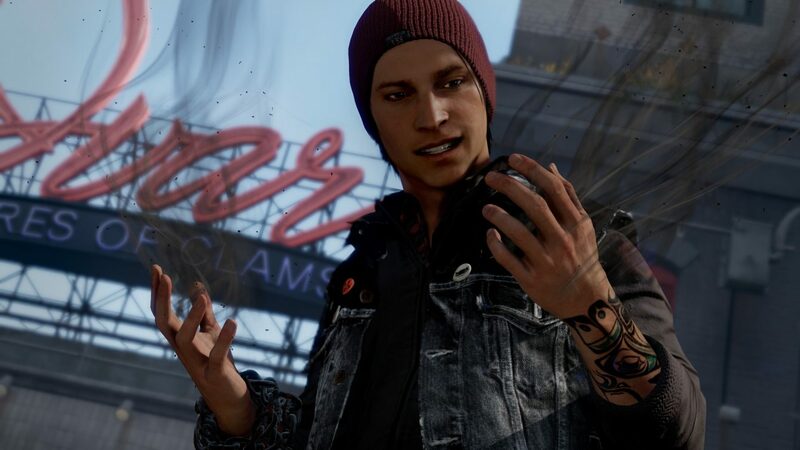 inFAMOUS: Second Son seems to surpass its predecessors in everything: graphics, gameplay, depth… Even the story seems, for what I was given a chance to see, a lot more interesting, with more relatable and likable characters, but ultimately everything seems to pale when compared to the fact that this is a game that expresses the pure joy of gaming from every pixel. 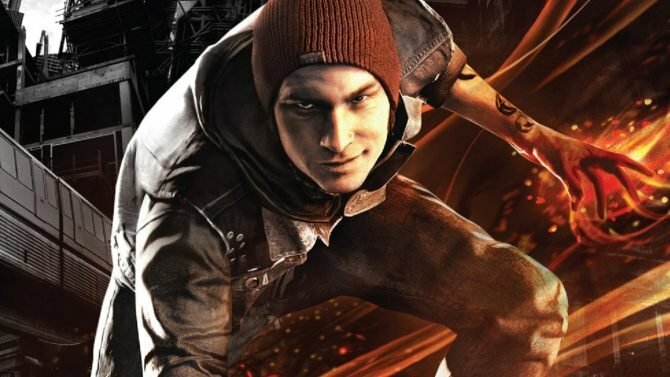 Sucker Punch set out to showcase just how damn fun our hobby can be, and from the two missions I could play, I’m quite confident that Delsin’s cocky grin will be reproduced pretty much exactly on your face as you’ll play. I know it was on mine. It still is now as I write. Like a last-stage superpowers junkie, I’m left wanting more.